Babies are springing up all over these days and tumbling into the REGI facility. Tis the season for Great-horned Owlets to leave their nest. 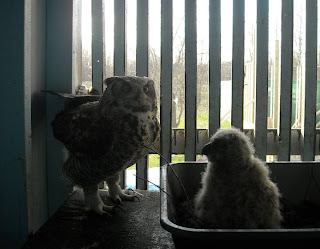 Young Great-horned Owls hatch in February in our region. They are the season’s earliest nester. Owlets typically leave the nest before they can fly. There are lots of biologic reasons for that and it works out to their advantage once the owls reach adulthood. The problem occurs if they are in an area that is close of human population centers. People cannot help but notice these adorable little fluff balls. As a result they are often picked up and taken into captivity. 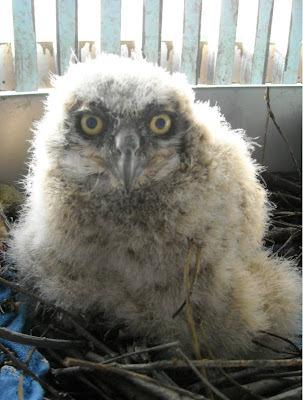 We have taken many calls this spring about Great-horned Owlets. Most of the time our role ends after advising the finders it is a natural part of an owlet’s life. We encourage people to try to make certain the little one is healthy and in no imminent danger from domestic animals such as cats of dogs and then to leave the area and let the youngsters be cared for by their parents. The parent birds are after all the best ones to raise their own babies. If the owlet has been injured, has truly fallen from a nest site too early and cannot be put back, or is an orphan, we can rear it here at REGI. 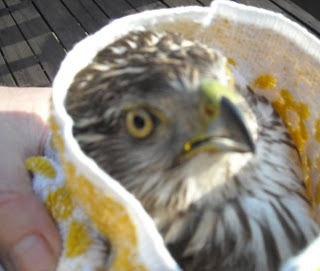 All raptor orphans that come into REGI are raised by foster parents of their own species. They hardly know they are in captivity, and are not imprinted to humans, but there is no way that we can ever hope to do better than their own parents. It is a very costly process just in terms of supplying the young owls with enough natural food until they are hunting on their own and can be successfully released in October Mice cost us about $1.00 each. Great-horned Owls at age 4 -6 weeks can eat up to 13-17 mice a night each. They are little rodent eating machines. That is one reason they are so wonderful for the environment. When you do the math of how many days it is from April to October, you can see the dilemma. We have one owlet in at this time. He is about six weeks old and is from the Wisconsin Rapids area. He is the victim of having fallen from a weak nest site which collapsed during a storm. The storm raged on and he was on the ground for thirty six hours. That was time to take action and bring him into captivity. 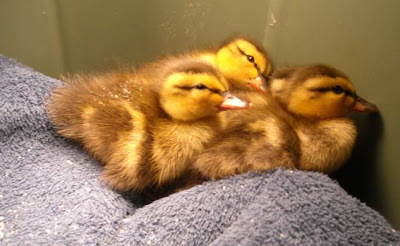 We are very lucky to have Nicki Christianson; a State of WI permitted mammal rehabilitator in the WI Rapids area that helps out in emergency cases such as this. She took him in for the night during the storm and was able to give him emergency care and a safe place to be until her could be transported to REGI in Antigo the next morning. Were it not for Nicki and other rehabilitators throughout the state and country with whom we network and our transporters, in this case Judy Marshall, that bring patients to Antigo, many patients would die before they ever got to REGI. The owlet from WI Rapids had some internal bleeding from the long fall and was weak from his adventure, but within a day was placed with his foster parents. He will have minimal contact with us from now on. 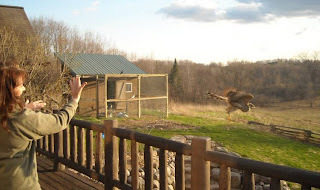 We supply food to the enclosure and the adults do the rest. We could learn so much about being parents from the wild avian world. The adults both male and female take over feeding and caring for young quickly and without question. Most importantly the youngsters need not be their own. We will handle the little one only when he has intermittent physicals to chart his growth rate. We will share photos of those events on this blog. 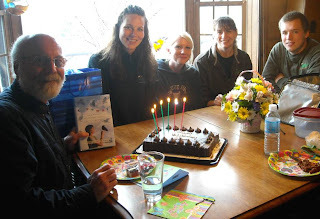 Our long time friend and environmental educator, Steve Fisher had a birthday earlier this week. The REGI team is as close as many families. We use every opportunity to celebrate and have cake and goodies so birthdays are celebrated with great enthusiasm here. Congratulations Steve! Releases are always a time of celebration. Several birds were released back to their wild home yesterday. Some we don’t have photos yet and will share during the upcoming week. A male Coopers Hawk in the photo below could hardly fly with the crop filled with food I gave him before her left REGI. He is just a year old and still has brown plumage and yellow eyes. Once he is an adult his feathers will be gray in color and his eyes dark orange. It is great to see them well and back out on their own. It is stacking up to be yet another event filled day. Spring is HERE!